Sams Teach Yourself Java in 21 Days (Covering Java 8 and Android), which covers Java 8 and was published in January 2016. Sams Teach Yourself Java in 21 Days (Covering Java 7 and Android), which covers Java 7 and was published in September 2012. Sams Teach Yourself Java 6 in 21 Days, which covers Java 6 and was published in June 2007. Sams Teach Yourself Java 2 in 21 Days, Fourth Edition, which covers Java 2 version 1.5 and was published in May 2004. 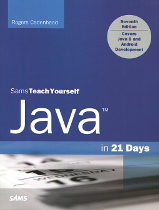 Sams Teach Yourself Java 2 in 21 Days, Third Edition, which covers Java 2 version 1.4 and was published in August 2002. Sams Teach Yourself Java 2 in 21 Days, Second Edition, which covers Java 2 version 1.3 and was published in September 2000. Use the links at the left or my home page to find the sites for other books that I have written.